Be a silent witness to the whole plus-one cycling of narratives, clarifications and metaphors. Take as many notes as you can of what is being said as it is said. Pay particular attention to the way the metaphors provide ways of reading the original situation. Approach the original situation from the perspective of parallel processes and situate it in relation to the plus-one process, the speaker and the actors within the speaker’s narrative. Summarise the narrative of the original situation in terms of the processes and outcomes described, and its framing assumptions. 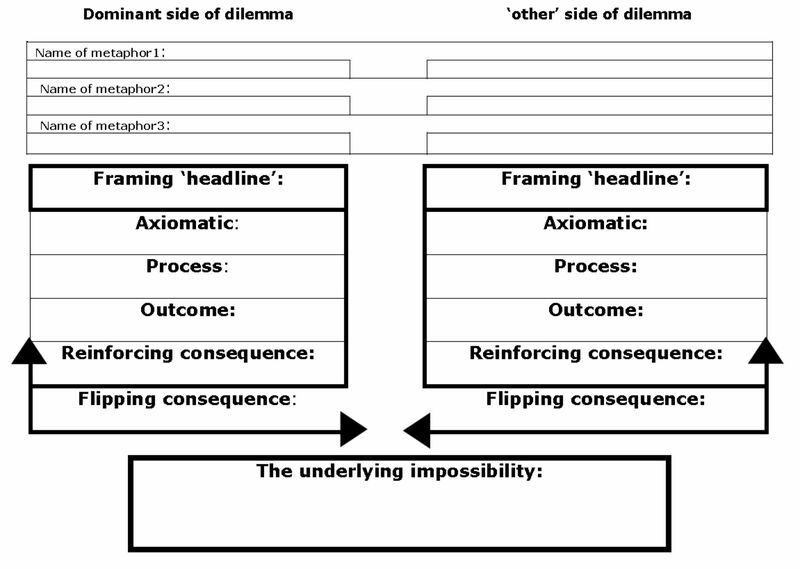 Create a ‘headline’ that characterises these framing assumptions and identify consequences that follow from the process-outcomes that form a frame-reinforcing cycle. Decide whether the narrative of the original situation is identified with the dominant frame within the larger context in which it arises, or with an ‘other’ position. Examine each of the three metaphors in turn, in each case identifying the implicit dilemma it gives voice to, i.e. what is included by the metaphor and what is excluded. Align one side of each metaphor with the way the narrative framed the original situation and then create an alternative framing that is aligned with what is excluded. Give this alternative framing its own ‘headline’. Develop a framing assumption, processes, outcome and reinforcing consequence for this alternative framing. Develop consequences that ‘flip’ each frame into its alternative and disrupt the current frame-reinforcing cycle. Satisfy yourself that these ‘flipping’ consequences describe an oscillation between the two frames. Hypothesise what the underlying impossibility might be around which this oscillation takes place and consider what it might be about the way the whole dilemma is framed that ‘sets up’ this oscillation. The mutually exclusive nature of the frames emerging from the plus-one process raises the question of how the oscillation between them is ‘held’ by the larger environment. This ‘holding’ refers not only to the resourcing available from the larger environment (with all the attendant constraints that this resourcing imposes), but also to “the management of experiences that are inherent in existence”, such as the completion (and therefore the responses to non-completion) of processes as defined by that larger environment. The treatment of the situation as a ‘crime scene’ is a way of approaching the question of whether or not this way of holding the situation is necessary, or whether it serves particular interests. See Boxer, P.J. (2017) Working with defenses against innovation: the forensic challenge, Organisational and Social Dynamics, 17(1) pp89-110. In a plus-one process, the nature of a preoccupying situation emerges from an originating narrative that frames the situation as articulated by a ‘speaker’ and clarified by a ‘listener’. The role of the ‘plus-one’ is to produce a metaphor based on a counter-transferential ‘hunch’ about the nature of the shape of this framing narrative as it relates to what is going on in this situation (‘wigo’). This metaphor is based on the feelings evoked in the plus-one by the relation of the speaker to the whole situation in the narrative as it is spoken, and at the same time points to an alternative ‘other’ narrative to the one articulated by the speaker. The relations within the plus-one process represent a way of framing what is going on (1 – wigo). Based on the concept of a ‘discursive practice’, the dominant frame is the way of framing ‘authorised’ by the power and knowledge of the dominant culture. This ‘way of framing’ may be characterized (i) by the authorized positions from which sense may be given to it through how the narrative is read (3), (ii) the unifying theme (4) through which its narratives can be made to cohere, reflected in the plus-one’s metaphor for the narrative as a whole, and the objects and concepts in terms of which the narrative is expressed by the speaker (2). The the speaking-and-listening axis (3-2) subject to the framing model (4) provide a shorthand for the way inter-subjective meaning is established. the ‘processes’, ‘outcomes’ and ‘reinforcing consequences’ are what maintain the performativity of this framing of ‘concepts’ and ‘objects’ with respect to what is going on (wigo) in the originating situation, as made sense of by the listener. The metaphors are created each time by the person in the ‘plus-one’ position, who has been listening to the way the speaking-and-listening process has made sense of the situation narrated by the speaker. This metaphor is chosen because it best speaks of the overall sense that has emerged for the plus-one from the speaking-and-listening about the situation. The plus-one has then elaborated on the metaphor as if it were a dream, making no attempt to relate its contents to the situation. This enables a good ‘feel’ to develop for what the metaphor is getting at. This is a matter of looking for the choice that was implicit in the metaphor. In effect we are looking for the ‘nightmare stage’ of the narrative situation speaking to the metaphor. For more on this way of reading a narrative in terms of the stages of ‘anticipation’, ‘dream’, ‘frustration’, ‘nightmare’ and ‘miraculous’, see betraying the citizen. The plus-one metaphor thus points towards an alternative ‘other’ narrative that enables the witness to formulate an alternative framing narrative of the originating situation. 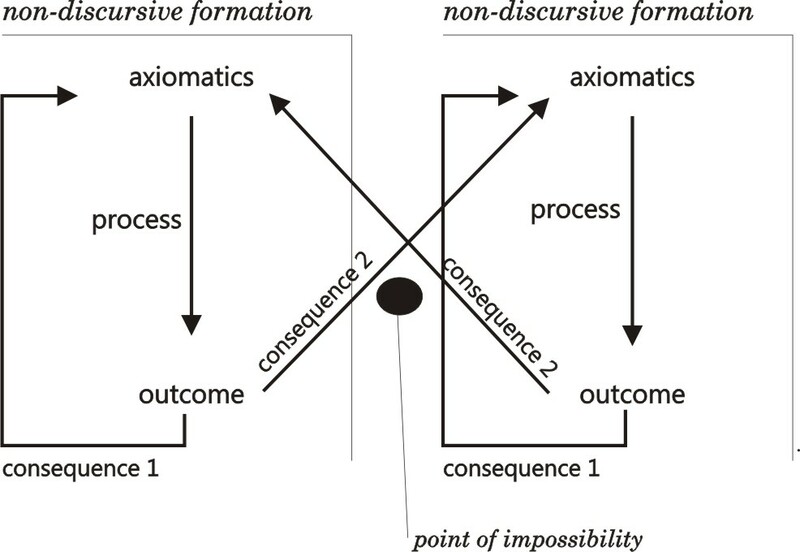 The validity of this ‘other’ narrative for the original speaker depends on establishing corroborating evidence of a ‘flipping’ consequence that can disrupt the performativity of the originating frame, flipping those involved with wigo into an alternative framing narrative subject to a different axiomatic. This alternative narrative is implicitly bound to the originating narrative through the way it will capture an oscillation. The ‘otherness’ of the alternative narrative reflects the way it is repressed by the dominant narrative, lying ‘below the surface’ of the speaker’s consciousness until it is brought to light, in this case by a plus-one process (Naylor, D., S. Woodward, S. Garrett and P. Boxer (2016). “What do we need to do to keep people safer?” Journal of Social Work Practice.). Taken together with the dominant narrative, however, it will point towards the underlying impossibility. The origin of this approach to understanding dilemmas lies with the Milan method of systemic family therapy (Cronen, V. E. and W. B. Pearce (1985). Toward an Explanation of How the Milan Method Works: An Invitation to a Systemic Epistemology and The Evolution of Family Systems. Applications of Systemic Family Therapy: The Milan Approach. D. Campbell and R. Draper. London, Grune & Stratton.). The following representation is a way of thinking about the oscillation over time between its two sides (Hampden-Turner, C. (1990). Charting the Corporate Mind: From Dilemma to Strategy. Oxford, Basil Blackwell.). The two Γ’s on the left and on the right frame ways of giving meaning to what is going on (wigo). The frame on the left is the dominant frame, while the frame on the right is ‘other’. Within each frame there is an implicit assumption held axiomatically, governing the reasoning within the frame. The cycle of process-outcome-consequence then reinforces this assumption. There is also a ‘flipping’ consequence that disrupts the self-reinforcing cycle within a frame, pushing the people involved with what is going on (wigo) into a different frame. The mutually exclusive nature of the two frames reflects an underlying impossibility, represented by the black dot. The dilemma’s implicit relation to an underlying impossibility is the relation to the objet petit a of an underlying lack, apparent in the oscillation around the black spot and referred to as ‘what is Really going on’ (wiRgo). For the person in the role of witness, the emergence of the ‘other’ framing reflects an underlying ambivalence implicit in their framing of the originating situation. Campbell, D. and M. Groenbaek (2006). Taking Positions in the Organization. London, Karnac. Winnicott, D. W. (1960). “The Theory of the Parent-Infant Relationship.” International Journal of Psycho-Analysis 41: 585-595. How are we to approach the relationship to the situation intended by reflective observation in triple loop learning? How do we ‘read between the lines’? This involves looking for the gaps between how a client situation is ‘read’ and the situation itself. Each project or organisation makes assumptions about what effects it creates or intends to created on its target customers or clients, and how. But in doing so, it also takes up a particular way of ignoring or leaving out aspects of the situation itself. This process takes about 60 minutes. It involves four roles: a speaker, a listener, and a plus-one. The exercise is in three rounds. The roles cycle in each round. The aim of the process is to become mindful of the gaps that emerge, i.e. of what is being left out, by the way the original situation is understood. This original situation is the situation presented by the first speaker. Meeting in threes, one person takes the role of the speaker, one of the listener, and one of the ‘plus-one’. The person in the ‘plus-one’ position should manage the time boundaries, ideally using a timer on someone’s smartphone. For 5 minutes, the speaker (2 in the diagram below) gives an account of a challenging situation faced by them. This first situation is the original situation. 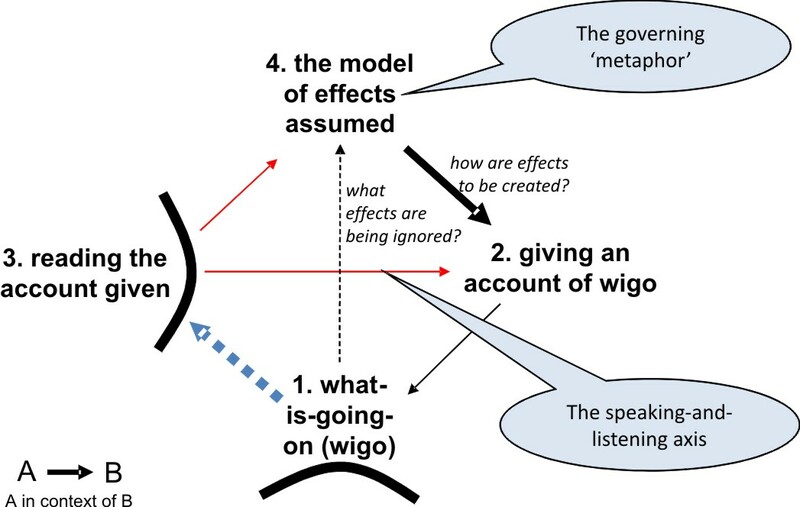 Note that the speaker is speaking about what is going on (wigo – 1 in the diagram below), which is the larger context in which the originating situation is situated. The listener (3) listens to this account in silence, and then for a further 5 minutes asks for elaboration and clarification, concluding with his or her summary understanding of the nature of the challenge being presented. This understanding constitutes a ‘reading’ of the situation presented by the speaker. The positions are then rotated two more times for two more 15 minute cycles, so that the plus-one becomes the speaker, the speaker becomes the listener, and the listener becomes the plus-one. In these second and third cycles, the speaker selects a situation from their own personal experience that speaks to the metaphor that they came up with in their plus-one role. In the last 15 minutes, the trio discusses what questions the metaphors raise about the originating situation in terms of counter-narratives, ‘gaps’ and the risks these imply as present. The narrative of the originating situation is set up within this circuit of relationships between speaking (2), listening (3) and the framing mental model (4). The relationship of this framing model to wigo (1) is implicit in the way speaking (2) gives an account of wigo (1) subject to the model (4). What is being ignored or left out by this model (4) is the particular ‘beyond’ or ‘lack’ of wigo, i.e. wiRgo, represented by what lies beyond the bottom thick line. The other thick line between the reading (3) and the (1)(2)(4) circuit is to indicate that this reading (3) only has access to the circuit via speaking (2) under the influence of the model (4). The process of active listening (3) allows the particular account of wigo (1) by speaking (2) to be known in such a way that a sense of its relationship to the framing model (4) can emerge, knowledge of (1) being mediated by the way (2) speaks subject to its influence. The other dotted-line axis is an impossible axis, in the sense that it cannot be held directly in the way that the speaking-listening axis can be held. It must therefore be approached through what the ‘plus-one’ person can imply about it from what passes between (3) and (2). The ‘plus-one’ exercise provides a way of understanding what it means to ‘read between the lines’. The split-screen journal is then a way of continuing to work with what-is-going-on based on this way of understanding. Looking for the gaps is thus not only about working with the difference between espoused theory and theory-in-use, but beyond that at the difference between ‘wigo’ and ‘wiRgo’ – not only what is symptomatic of the interests of the organisation itself in wigo, but also what is symptomatic about what is being discluded of wiRgo. In this sense, the plus-one process aims to go further than the Balint method, which aims to establish an ‘observing ego’ aka listener through which the clinician is able to look at himself or herself and assume the participant-observer position in relation to himself or herself – a position that some psychoanalysts refer to as the internal supervisor, creating an internal space of thinking for the clinician. See Theory? Who needs theory? by the Balint Society. This can be thought of as (what the ‘plus-one’ perceives to be) the shape of the ‘governing metaphor’ of the speaking-and-listening process, i.e. the ideal or organising frame within which the speaking-and-listening is given meaning, but devoid of any content relating directly to the explicit content of the speaking-and-listening. The experience chosen may be thought of as a ‘gift’ given to the process that speaks to their counter-transferential response as plus-one. All three metaphors are thus related to the challenge underlying the originating situation. The best way of working with these insights is to put them into the form of a dilemma. See using dilemmas as drivers of change. For more on the thinking about the above diagram and its relation to the impossibilities, see formulating network interventions. The stratifications needed to sustain network interventions are discussed in on stratification. The dotted blue line arrow from wigo (1) to the reading (3) indicates the absence of a direct relation to wigo and the unconscious primary process underlying wigo (1), with which the reading (3) is implicitly aligned. In these terms, the relation to wigo (1) of reading (3) and speaking (2) subject to the model (4) is that of secondary process.